Hieronymus Bosch was an Early Netherlandish artist who dedicated his life to producing works that broke away from traditional Flemish painting. His work used vivid imagery to depict moral and religious ideas and stories, and he set himself apart from his contemporaries with the disturbing detail of his panel pictures. Relying heavily on symbolism and working fluidly, Bosch created artworks that expressed the social and political turmoil of the era. An eccentric artist, many of his paintings focused on the torments of hell and his later works in particular were highly original and sometimes offered a literal translation of verbal metaphors set out in the Bible. Both wonderful and terrifying, Bosch's works were unforgettably brash and his technique remains unmatched to this day. Bosch was born and lived his whole life in s-Hertogenbosch, near Antwerp and he belonged to the Brotherhood of Our Lady, a religious sect comprising 40 influential citizens of 's-Hertogenbosch, and 7,000 other members from across Europe. He painted several altarpieces for the Brotherhood for the Cathedral of Saint John's in s-Hertogenbosch but all of these are now lost. Due to the fact that the artist signed just seven of his works, it is unclear how many paintings he actually created during his career and many that were assigned to him are now questionable. Today there are around 25 definitive paintings attributed to the Bosch. Upon his death Hieronymus Bosch was an internationally renowned artist whose works were celebrated and listed in the inventories of noble families of the Netherlands, Austria and Spain. Hieronymus Bosch was born Jeroen Anthoniszoon van Aken but took his name from the place he lived and worked, 's-Hertogenbosch, commonly referred to as 'Den Bosch'. Bosch's ancestors had settled in the Dutch city in the late 14th or early 15th century and their family name, Van Aken, implies that they originated from the German town of Aachen. Bosch's grandfather, Jan van Aken, was a painter who had five sons, four of whom went on to become artists. Bosch's father, Anthonius van Aken, is known to have worked as an artistic adviser to the Brotherhood of Our Lady which was one of several groups devoted to the worship of the Virgin during the late middle ages. The exact date of Hieronymus Bosch's birth is questionable but it's thought to have been around 1450 due to a hand drawn portrait (possibly a self-portrait) produced just before Bosch's death in 1516. The drawing depicts the artist in his old age, probably in his late sixties. The first mention of Hieronymus Bosch is in a municipal record in 1474, when he is named along with his siblings - two brothers and a sister. One of his brothers, Goossen, was also a painter. It's likely that Bosch received his artistic training from his father or one of his uncles but none of their works exist today. In 1463, 4,000 houses in 's-Hertogenbosch were destroyed by a disastrous fire, an incident that the young Bosch presumably witnessed. Such an experience may have impacted on his choice of subject matter later on in his career but to this day little is known about Bosch's personality or artistic preferences. Despite his pessimistic paintings, he was popular during his career and often gained commissions from abroad. Bosch married Aleyt Goyaerts van den Meerveen sometime between 1479 and 1481. She was a little older than the artist and came from a wealthy family. The couple moved to the nearby town of Oirschot as Aleyt had inherited a house and land there. Between 1486 and 1487, Bosch's name first appeared in the membership lists of the Brotherhood of Our Lady, which was by now a large and affluent organization that commissioned works to decorate the chapel of Our Lady. Most of Bosch's family belonged to the Brotherhood, fulfilling various roles throughout the years. As there is little written evidence of Bosch's life, such as letters or diaries, much of what is known about the artist has come from references to him in the municipal records of 's-Hertogenbosch, as well as the account books of the Brotherhood of Our Lady. Bosch's death is recorded in an entry in the accounts of the Brotherhood of Our Lady in 1516 and his funeral took place in the church of Saint John on 9 August that year. "The master of the monstrous... the discoverer of the unconscious." "Who will be able to tell of all the weird and strange ideas which were in the mind of Jeronimus Bos, and his expressions of them by his brush? He painted gruesome pictures". Early paintings by Bosch are rather awkward in their drawing and composition and his brush work was somewhat limited. 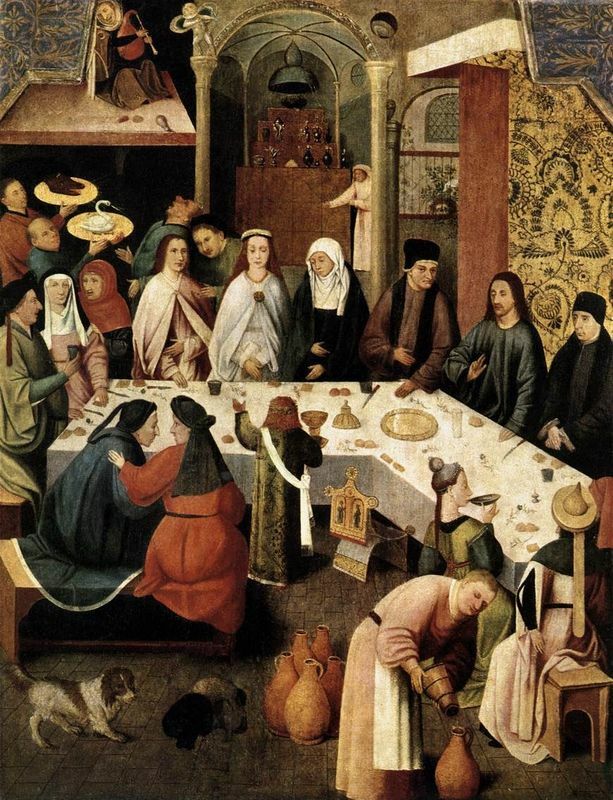 Examples from this period include Extracting the Stone of Madness, Table of the Mortal Sins, Marriage Feast at Cana, Ecce Homo and The Magician. In such works, the artist portrays the vulnerability of people when tempted by evil or lust and he depicts humanity as ignorant or absurd when faced with different challenges on life's journey. The imagery Bosch uses, however, is still rather conventional, and it is only in a small number of works that strange figures such as demons or magicians are featured. 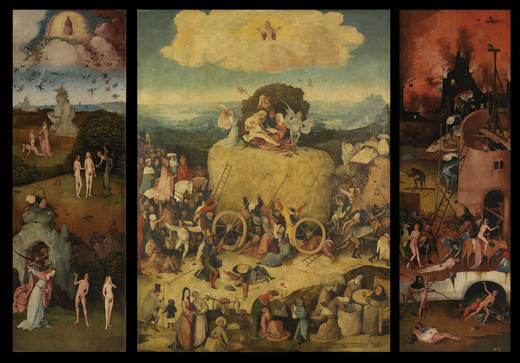 It was in the middle stages of his career that Bosch created his large triptychs such as The Hay Wagon, The Temptation of St Anthony and The Garden of Earthly Delights. These complex works portray graceful figures and subtle colors and they were highly ambitious projects to undertake. Bosch combines elements of fantasy and chaos with pleasant scenes of mankind in the age of innocence. 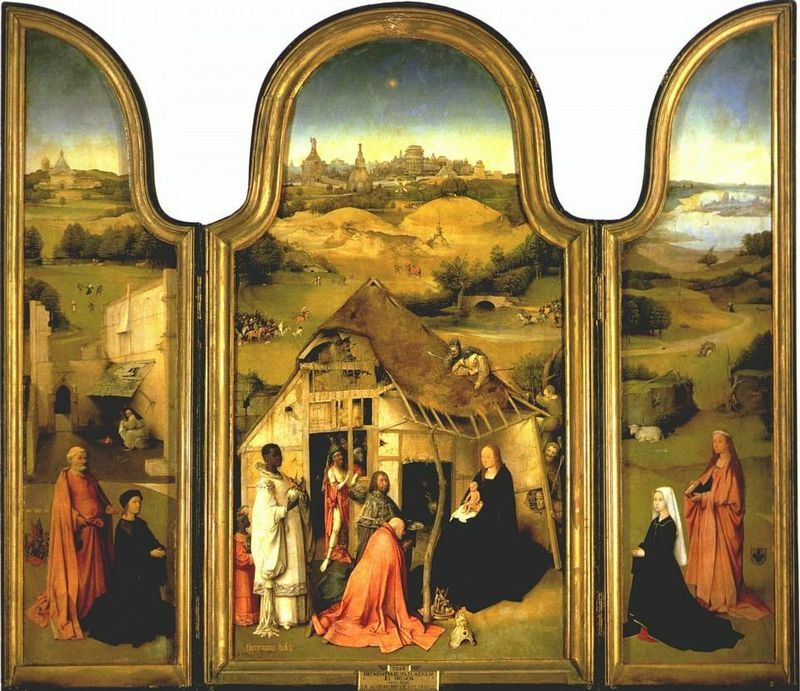 Bosch's triptychs were evidence of his developing thought processes and the evolution of his earlier works. His mixture of dreams and reality is particularly evident in The Hay Wagon, whose outside wings or cover panels, depict the scenes of the Seven Deadly Sins. The style used for The Hay Wagon is similar to that of watercolor. 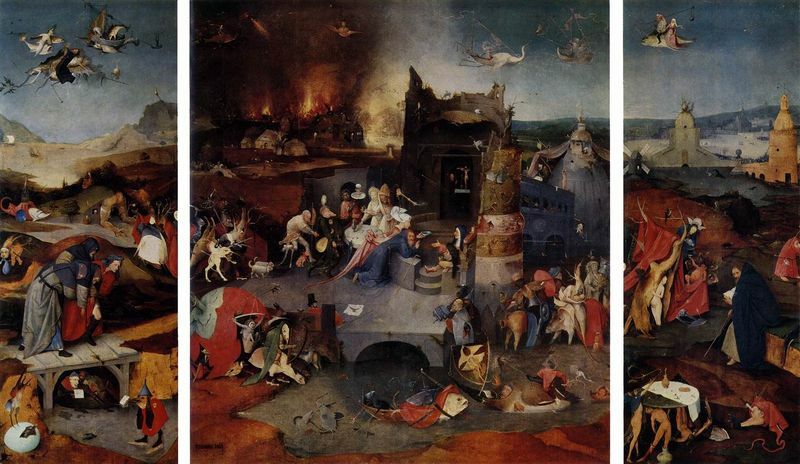 The central panel shows a version of the Flemish proverb "The world is a haystack from which each takes what he can," and the artists exemplifies the trickery of the demon leading people from the earthly paradise shown on the left wing to the depths of Hell shown on the right. Bosch's most famous artworks are exceptional and are immediately recognizable thanks to their half-human half-animal creatures, mixed with human figures. His basic subject matter is often simple but tied in to additional narratives and symbols. His representations of Christ and the saints show the innocent central figure plagued by horrendous creatures of evil and temptation and The Temptation of St Anthony is the best example of this genre. In his later career Bosch's works were quite different. The scale of his paintings changed considerably and rather than depicting hellish landscapes filled with tiny beings, he created compacted groups with half-length figures. 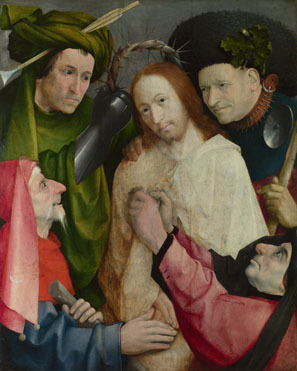 Images such as Christ Mocked (The Crowning with Thorns) and Christ Carrying the Cross are dramatic and close-up, so much so that the viewer feels as though they are taking part in the event both physically and psychologically. 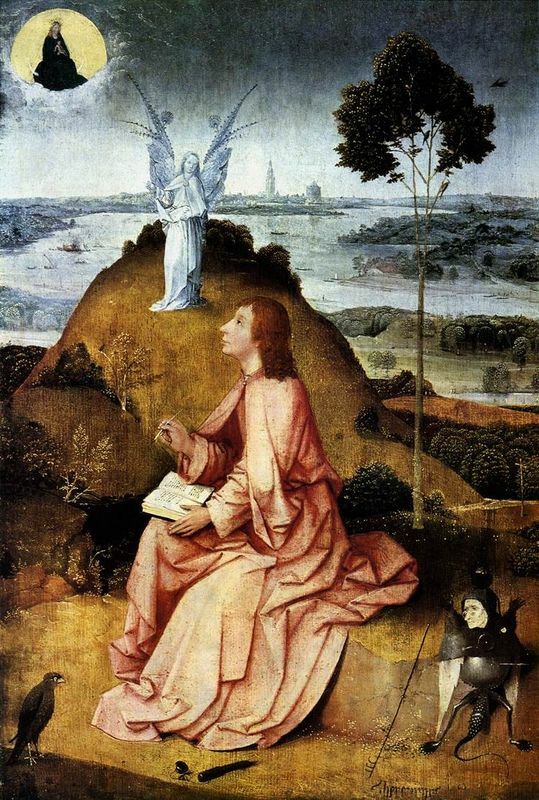 More subdued and mature works produced by Bosch in his later years also show different saints in contemplation or repose and they include St John the Evangelist in Patmos and St Jerome in Prayer. Despite the fact that Bosch's career thrived during the High Renaissance, the area in which he lived was very much dominated by the beliefs of the medieval Church. Although the artist would have been exposed to some of the new forms of expression, particularly those in Southern Europe, it is difficult to ascertain which artists, writers and conventions impacted on his work. His style was very different to that of Jan van Eyck or Rogier van der Weyden, the two artists who were most influential in the development of style in the Low Countries until around 1500. A lack of information about Bosch, his life and inspirations, further hinders an understanding of his imagery and any interpretation of it. It's more than likely that Bosch was influenced by the Flemish school of painting, but he was still individual in his style and technique. Unlike Flemish artists who depicted a world of reality and serenity, Bosch preferred a world of horror and imagination. His fantastical creations were unusual and many believed that he must have been a morbid soul to have been able to create such depressing images. Yet, Bosch worked at a time when the medieval period was coming to an end and therefore his paintings most probably reflect his anxiety over a changing world. 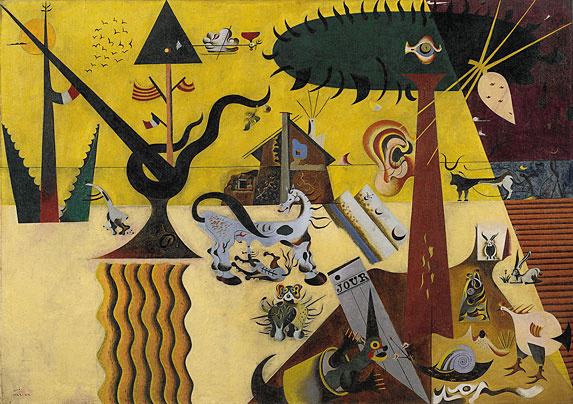 Many of the paintings he produced are similar to the works created by the Surrealists centuries later. 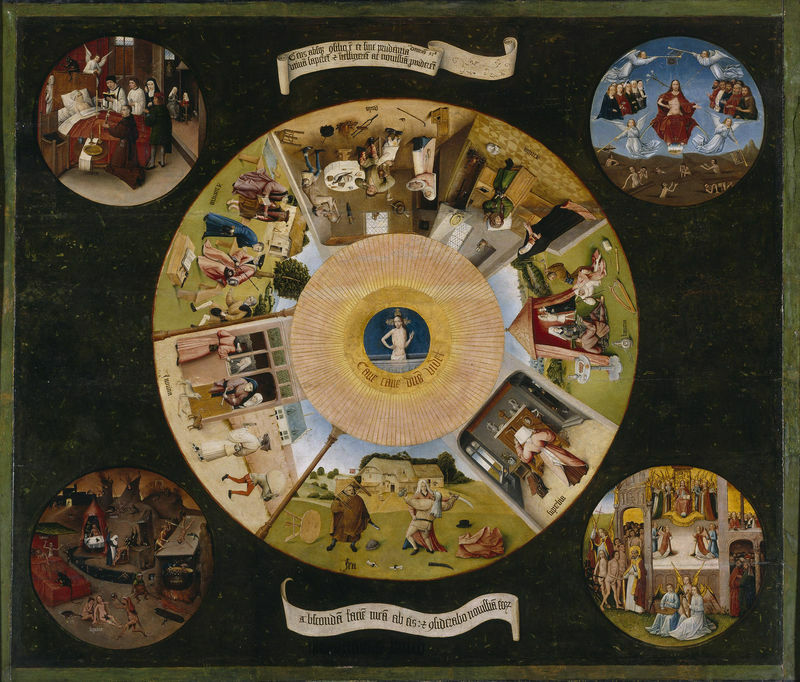 They too paint a world based on fantasy and therefore Bosch's works and fantasies are strangely modern and his popularity among contemporary artists and art fans has consequently been strong. Aside from the grotesque elements of Bosch's works which made him a precursor to the vision of the Surrealists, the lasting beauty of his paintings stems largely from his vivid color and brilliant technique, which was much more fluid than that of most of his contemporaries. Additionally, Bosch was an outstanding draughtsman and among the first to make drawings as independent works. During his lifetime Bosch was a celebrated painter and a generation or so after his death his works were eagerly sought-after and collected by Philip II of Spain. Through prints Bosch's works reached a wider public and many copies of his works were made even when he was alive. However, it was not until Pieter Bruegel the Elder that another Netherlandish artist was able to develop Bosch's vision rather than simply imitate it. Pieter Huys was another notable follower. As Hieronymus Bosch was a visionary artist with a distinct style, he was not as influential as other dominant painters of the era. 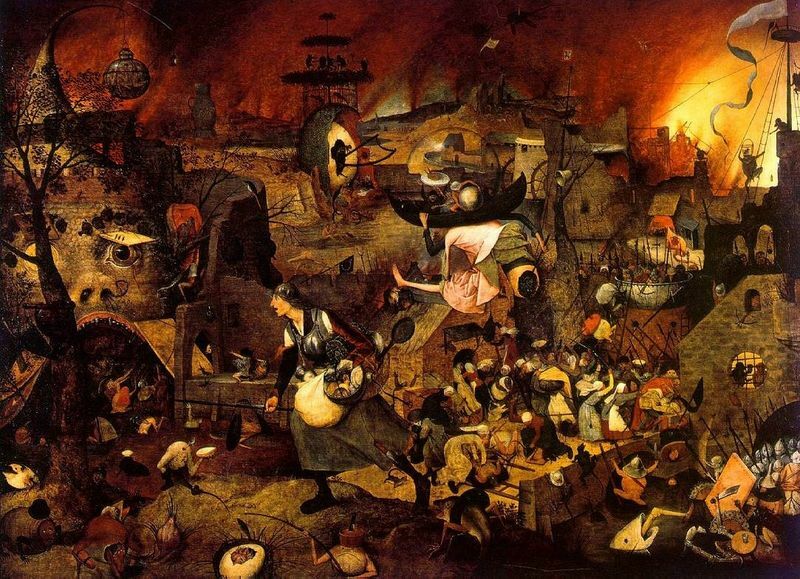 Nevertheless, several emerging artists included elements of his work into their own, namely Pieter Brueghel the Elder. Drawing inspiration from Bosch's The Garden of Earthly Delights's inner right panel, Brueghel created Mad Meg which shows a peasant woman leading an army of women to steal from Hell. 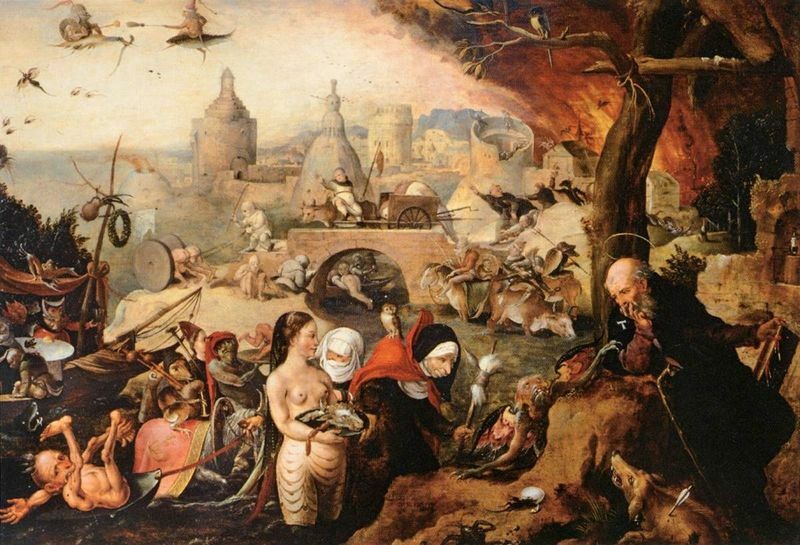 Brueghel's The Triumph of Death also draws on the Hellscape of The Garden and uses a similar vibrant color palette. Italian court painter Giuseppe Arcimboldo was famous for his peculiar vegetable portraits which showed heads of people composed of roots, plants, webs and other organic matter. His works resemble Boschs in their deprature from precise and accurate representations of nature. 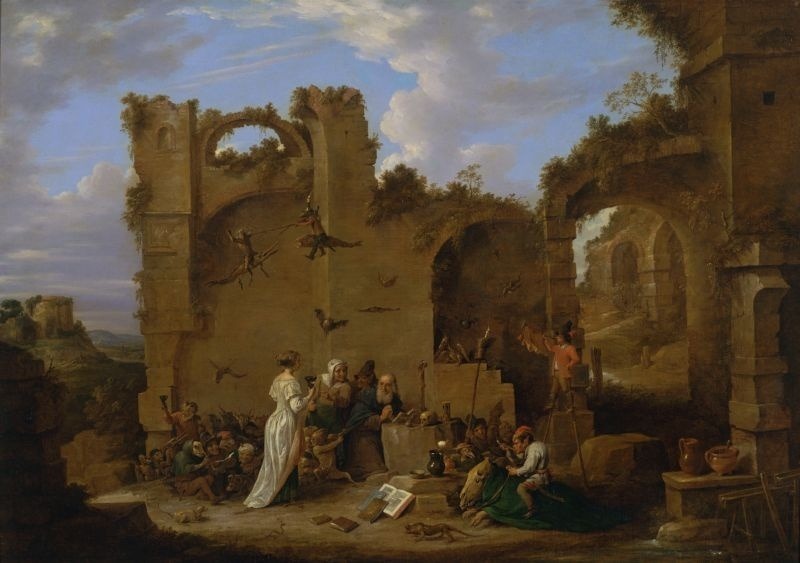 David Teniers the Younger was a Flemish painter who referred to both Bosch and Breughel as inspirations for works such as The Temptation of St Anthony, the Rich Man in Hell and Mad Meg. In the early 20th century there was a renewed interest in the works of Hieronymus Bosch thanks to the early Surrealists' love of dreamscapes and focus on a free-flowing connection to the psyche. 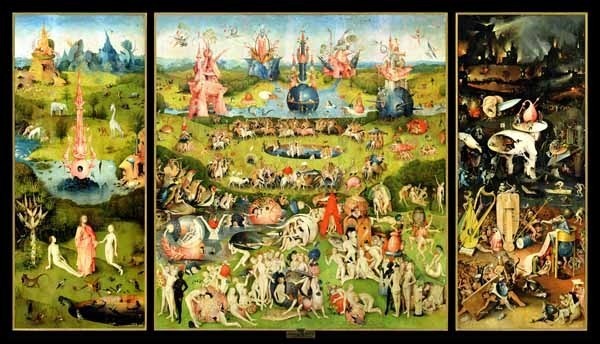 Bosch's imagery was admired by Joan Miró and Salvador Dalí in particular and both had seen his work The Garden of Earthly Delights in the Museo Nacional del Prado. Other Surrealists inspired by Bosch's The Garden of Earthly Delights include René Magritte and Max Ernst and in 2009, the Museo Nacional del Prado selected this work as one of the its fourteen most important paintings. A there is little evidence of Bosch's influences and patrons, it has been extremely difficult for art historians to interpret his works and understand his distinct mode of expression. Yet, scholars have debated the artist's iconography more expansively than any other Netherlandish artist. In 1560, in one of the earliest accounts of Bosch's works, Spaniard Felipe de Guevara wrote that Bosch was regarded merely as "the inventor of monsters and chimeras". 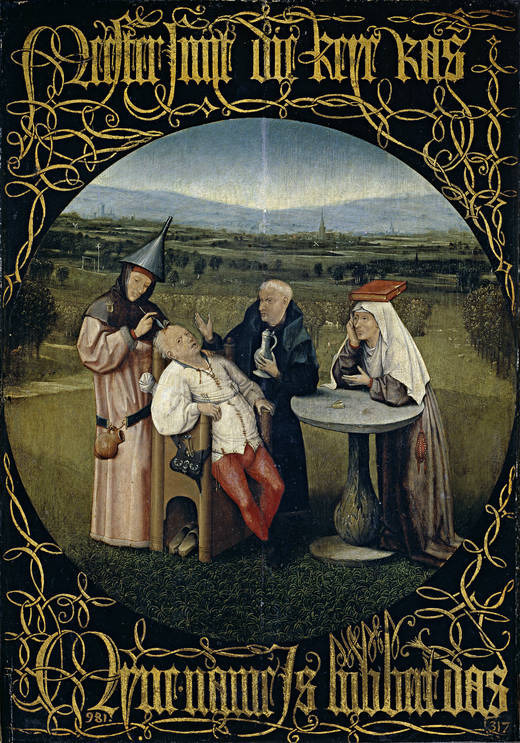 In the twentieth century, when changing artistic tastes meant that Bosch captured the European imagination, some argued that his art was inspired by heretical points of view. 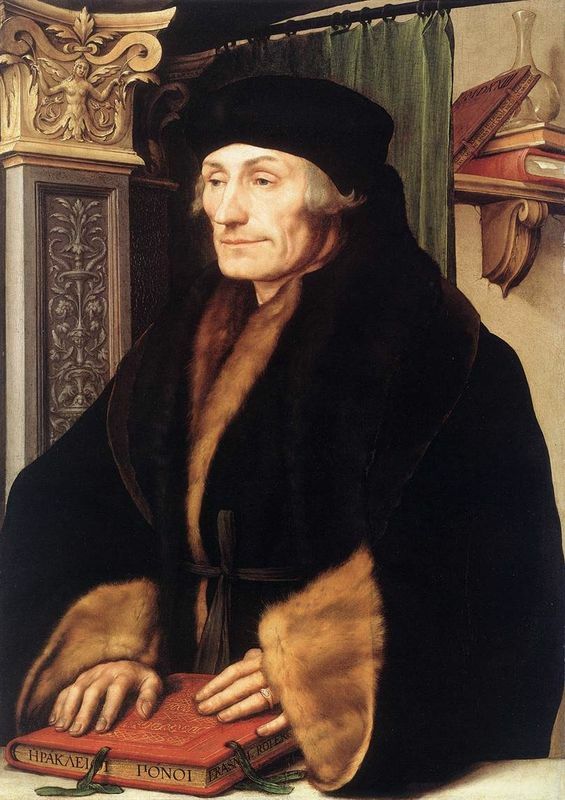 Due to the fact that the writer Erasmus was educated at one of the houses of the Brethren of the Common Life in 's-Hertogenbosch, a town that was religiously progressive and Bosch's hometown, some find it unsurprising that there are links between the scathing writing of Erasmus and the works of Bosch. Others claimed that Bosch's art was intended to titillate and amuse, much like the "grotteschi" of the Italian Renaissance. 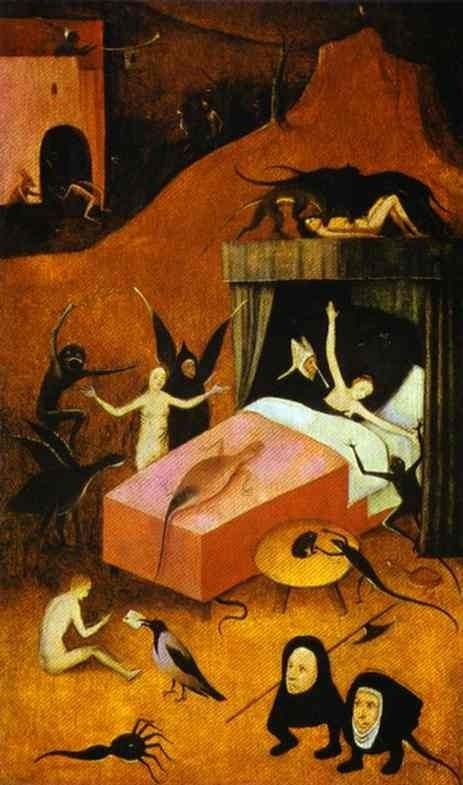 Unlike the art of the older masters which was based in the physical world of everyday life, Bosch's paintings were confrontational and according to art historian Walter Gibson they offer, "a world of dreams [and] nightmares in which forms seem to flicker and change before our eyes. " 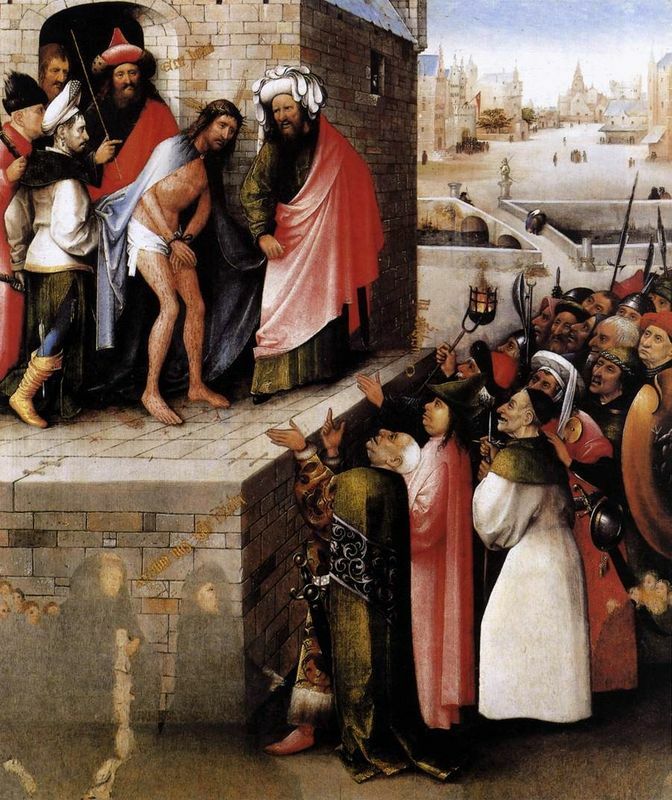 More recently, scholars have regarded Bosch's vision as less fantastic, and accepted that his art mirrors the orthodox religious belief systems of his age. His portrayals of sinful humanity and representations of Heaven and Hell are now seen as in-keeping with those of late medieval didactic literature and sermons. Thus, most writers attach a greater significance to his paintings than before and try to interpret them in terms of a late medieval morality. 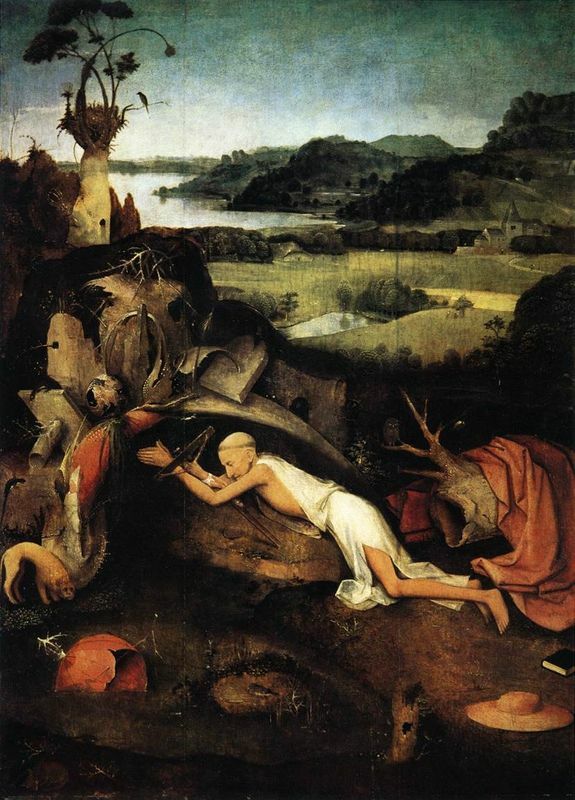 Generally, it is now thought that Bosch's art was created to teach specific moral and spiritual truths in the same way as other Northern Renaissance figures, such as the poet Robert Henryson, and that his imagery has exact and premeditated meaning. Yet, conflicting interpretations of Bosch's works still exist and these raise important questions about the nature of "ambiguity" art of his era.